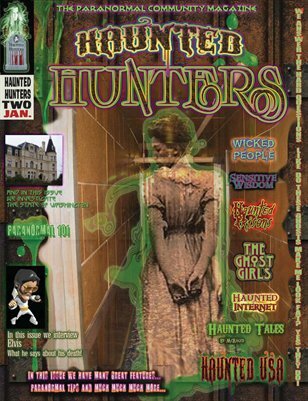 Welcome to our second installment of the Haunted Hunters Magazine! We have been working through the Holiday Season to ensure that you get the very best the paranormal world has to offer you in 2011! In this issue we will again visit our Paranormal 101 to take your team into the New Year with tips and advice while in the field; we will also feature the top ten most haunted prisons in America. McRager will keep you on the edge of your seat as he brings to you his fearless and comical side of his Haunted Tales. We are proud to welcome The Ghost Girls from Austin, Texas in our Paranormal Spotlight with their feature investigation of a private residence in Calvert, Texas. This team shows what benefits and relief a paranormal team can bring to home owners when faced with unexplained phenomena in their home.